Fresno Bee reported this today. Here's a link to the BakersfieldNow report. It appears that idea was expressed by the pistol-carrying hiker??? Not sure how having cell reception would cushion a 200-foot fall. On the other hand, if there were better cell reception, emergency calls would be able to communicate more information to the rescuers. It appears this fall occurred on the west side, and I am sure Sequoia N.P. is never going to install any cellular equipment in the backcountry. Climbers have the rare ability to gamble the rest of their lives on one step. Doesn't even need to be a climber, sounds like he was just following the simple trail and maybe stubbed his toe, or placed his foot too close to an unstable edge. It's easy to do that whether ataxic or not from AMS. Correct me if I'm wrong... but didn't cell phone coverage actually -cause- a SAR on Whitney in 2008 or so... some guy was so intent on his conversation (because he actually had reception) that he walked off the edge of a cliff and had to be rescued? Bob R happened to be setting up an overnight camp above Trail Camp when he got word of the accident. 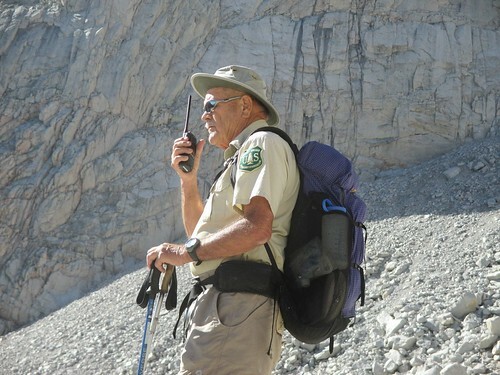 He and his group were able to climb to Trail Crest and help the Seki helicopter locate the spot, and help with SAR communications. Paving the trail would contribute to less falls and putting in a tram would eliminate all sorts of problems...just saying. The trail, for the most part, is the John Muir WILDERNESS. We have gone on ad infinium about solar latrines on this trail and what it would take to get them back up and running. Wha'cha think it would take to get a series of cell towers built. Put a tram to the top with a paved trail (with handrails) coming back down. Rename it the John Muir Wilderness Experience Theme Park. Put cell towers on top of the new power flush toilets in each Starbucks/strip mall on the path. Looking forward to the Mt Whitney Zip Line!!! I guess I'm just a softie, but I don't see the humor or the connection to a 60-yr man falling to his death. I'm having a hard time laughing about this crazy talk of zip lines, trams, flush toilets, and scooters. All this because of one guy's opinion about the value of having better cell reception? Reply to one of the cell phone threads if that's the point of this, it's been rehashed ad naseum already. If hiking with 200 other people on a trail littered with plastic poop bags, cables on the switchbacks, to a peak with a stone hut and circus atmosphere is considered "wilderness" I feel sorry for you. Mt Whitney is an awesome and rewarding trophy hike in the High Sierra's, but if you're looking for true wilderness, keep walking. Plenty of true wilderness just beyond this special place. Rest in peace, Mr. Kato. Mr. Kato was reportedly quite ill at the summit 90 minutes before his fall (according to the video interview). It seems likely that AMS played a role in his fall. It's possible that AMS started for him at the summit and he had no choice but to climb down, but it's more likely that he struggled with AMS while climbing and it worsened at the summit. I hope there's a follow up article, but they tend to get buried or dropped. Maybe the SAR report will shed some light. You don't have to get very far off the main Whitney Trail to experience TRUE wilderness. There are places close by that receive very few visitors ever - you just have to explore. Without the cell phone of course. That thin line of trail to the top may not be a wilderness experience, but there is plenty of it close by. And I don't see any reason to speculate why a man died. None of us reading reports and news stories have any real idea. Maybe he was sick, maybe he tripped, maybe his GOD called him home. I don't think anyone was making light of the man's death, just poking fun at the idea of more cell phone towers. Another hiker on the trail emailed me to say that he was quite sick before he fell. Possibly even threw up just before. The thinking is that in his weakened, dizzy and maybe disoriented state, he mis-stepped, or misjudged the edge, and fell over the edge. The spot, if I understand correctly, was maybe a hundred yards before the base of Mt Muir (closer to the MMWT/JMT junction). I am sure we all offer our condolences to the Kato family. If your brain is on hiatus, no amount of technology will save you, or get you a rescue more quickly, no matter if you're in wilderness or not. To give an example from a little higher, my friend Bob S developed early HACE on Kili. It is a simple trail but he could not stay on it, he seemed coherent but just kept veering to the right - had to be escorted down where he recovered. Ataxia (unstable/wobbly gait/balance) is considered a reliable sign of HACE, a life-threatening complication of AMS. It is a rare diagnosis on a mountain the height of Whitney, but possible. Ataxia it is said to be a sine qua non - an essential manifestation that by itself highly suggests the diagnosis. Although HACE can develop rapidly in just hours, usually it is over days or weeks and higher up, and usually by the time ataxia shows up, earlier signs have been missed, underestimated, or ignored by the climber and those around him. The earliest symptoms of HACE and HAPE, for even the most experienced climber, can be confused with the usual discomforts of acclimatization, and a misunderstanding can be fatal. We do not know if the unfortunate man in our case here may have had HACE, but just any degree of AMS can make you feel so bad that you get Mountaineer's Foot - can't put one in front of the other (or in the right place). For whatever reason out of many; AMS, non-AMS illness or fatigue, simple fall, whatever it was, his walk in the sky became his last. Rest in Peace. I can appreciate that you got decent gouge Steve, but really, it's all speculation. It's a sad thing to die in the back country yet I think it's sad when people die crossing the street. Agree. Point is, the Whitney "Zone" is a specially designated area that should not be confused with true wilderness. Responsible management of high impact areas like Whitney (17,000 people a year) and Half Dome call for special rules and tools to keep them available to the public without ruining them. If cell coverage happens to extend to these popular areas, that's probably a good thing overall, but nobody is calling for a cell tower on the summit or paved trails or flush toilets or zip lines. Even the article said that better cell phone coverage would not have saved him nor accelerated a rescue. This thread just got a bit off topic and I'm sure nobody meant disrespect. Based on the reports, AMS seems quite likely to have played a role. True, we don't know for sure right now, but it seems on point and a valuable reminder to discuss AMS regardless. Harvey's expert comments make it a good teaching moment. Our resident Geek might bee able to dig up this most excellent article somewhere in our archives. As an afterthought, I will mention that I just got over my 5th(!) episode of pneumonia, but yet, I still missed the early signs. Our lost comrades did not have 5x to blunder. We were all tired from the effort of the 2500' gain. But, after retrieving the cache, Tom was surprisingly fatigued. We didn't know it at the time, but this was the beginning of a major turning point in our expedition. It's a harrowing story. Close calls, dangerous falls, narrow safety margins, frostbite. Things could have easily turned out far worse. Bottom line, though, is that HAPE can creep up on unsuspecting parties. With dangerous results. Generated in 0.198 seconds in which 0.186 seconds were spent on a total of 15 queries. Zlib compression disabled.